Michel Barnier issued the following statment in response to the speech given by Theres May in Florence. The speech shows a willingness to move forward, as time is of the essence. We need to reach an agreement by autumn 2018 on the conditions of the United Kingdom’s orderly withdrawal from the European Union. The UK will become a third country on 30 March 2019. Our priority is to protect the rights of citizens. EU27 citizens in the United Kingdom must have the same rights as British citizens today in the European Union. These rights must be implemented effectively and safeguarded in the same way in the United Kingdom as in the European Union, as recalled by the European Council and European Parliament. Prime Minister May’s statements are a step forward but they must now be translated into a precise negotiating position of the UK government. With regard to Ireland, the United Kingdom is the co-guarantor of the Good Friday Agreement. Today’s speech does not clarify how the UK intends to honour its special responsibility for the consequences of its withdrawal for Ireland. Our objective is to preserve the Good Friday Agreement in all its dimensions, as well as the integrity of the Single Market and the Customs Union. The EU shares the goal of establishing an ambitious partnership for the future. The fact that the government of the United Kingdom recognises that leaving the European Union means that it cannot keep all the benefits of membership with fewer obligations than the other Member States is welcome. In any case, the future relationship will need to be based on a balance of rights and obligations. It will need to respect the integrity of the Union’s legal order and the autonomy of its decision-making. We look forward to the United Kingdom’s negotiators explaining the concrete implications of Prime Minister Theresa May’s speech. Our ambition is to find a rapid agreement on the conditions of the United Kingdom’s orderly withdrawal, as well as on a possible transition period. The Prime Minister, Theresa May, made a speech in the Italian city of Florence on 22 September 2017, to announce her vision of a new era of cooperation and partnership between the UK and the EU following Brexit. She made the speech in an attempt to break a perceived deadlock in the on-going Brexit meetings with the EU, due to continue next week with the 4th round of negotiations, and to move on to talk about the future relationship between the UK and the EU. There are a number of major differences between the UK and the EU in some areas of the negotiations which are currently focused on the arrangements for the UK’s withdrawal from the EU and covers the topics of EU Citizens Rights, Ireland and Northern Ireland and a financial settlement required by the EU from the UK. On Ireland she said, the UK was committed to protect the progress made in Northern Ireland over recent years and the lives and livelihoods that depend on this progress. The UK position on this is that British courts should have the final say while the EU considers that the European Court of Justice should have the final say. This is non-negotiable as far as the EU is concerned. 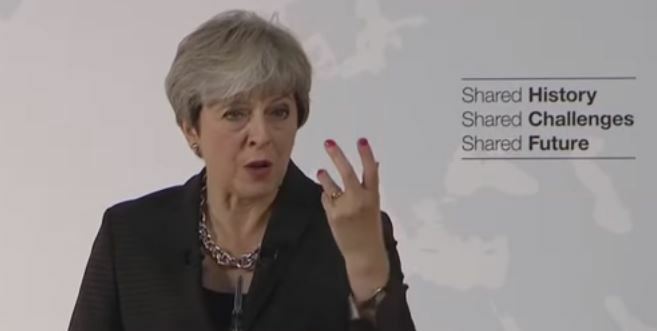 For a future Trade agreement between the UK and the EU, she also dismissed the idea of using an existing model, such as the arrangement between the EU and Norway or the Free Trade agreement between the EU and Canada, as a template. To support this approach, she pointed out that the UK is currently the EU’s largest trading partner, is one of the largest economies in the world and it’s market is of considerable importance for many businesses and jobs across the continent. In order for a future trade partnership to work she suggested an appropriate mechnaism should be found for resolving future disputes without the involvement of the European Court of Justice or UK courts. Presumably using an International Court or arbitration service. She also proposed an “implementation period” after the UK leaves the EU in March 2019, with access to one another’s markets continuing on the current terms, for a time limited period. …such an agreement on the future partnership will require the appropriate legal ratification, which would take time. She suggested the implementation period (which has also been called a transitional period previously) should be for not more than 2 years and that during the implementation period EU citizens coming to work and live in the UK would be required to register – something which will probably not go down well in the EU. So during the implementation period, people will continue to be able to come and live and work in the UK, but there will be a registration system – an essential preparation for the new regime. There was also an indication that the UK would continue payments to the EU to honour commitments made previously. If this was meant during the transitional period of 2 years, it has been suggested that this could amount to around £18 million or 20 million euros in total, although an actual amount has not been specified by the PM or her Government. Overall, there didn’t appear to any new suggestions which were significantly different to anything which has been said in the past. Whether her speech has succeeded in opening up the Brexit negotiations to discussions about the future relationship between the UK and the EU remains to be seen. Every year in September, the President of the European Commission delivers his State of the Union Address to the European Parliament, taking stock of achievements of the past year and presenting priorities for the year ahead. Jean-Claude Junker presented his State of the Union Speech for 2107 on the 13 September. He mentioned the recent trade agreement between the EU and Canada, talked about a new economic partnership with Japan and looked to do the same with Mexico and South American countries. He also proposed opening trade negotiations with Australia and New Zealand. He wants the EU to continue in leading the fight against Climate Change and promised to continue to address the issue regarding refugees. My hope is that on 30 March 2019, Europeans will wake up to a Union where we all stand by our values. Where all Member States firmly respect the rule of law. Where we have shored up the foundations of our Economic and Monetary Union so that we can defend our single currency in good times and bad, without having to call on external help. Where a single President leads the work of the Commission and the European Council, having been elected after a democratic Europe-wide election campaign. There should be a single President, rather than in the current system with leaders representing the member states, the Commission and the Parliament. Boris Johnson has recently stirred up (again) the issue of how much the UK pays towards the EU budget, repeating claims of £350M being sent to the EU every week. 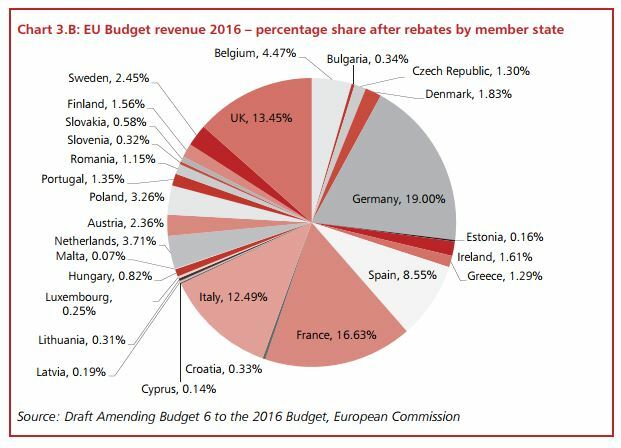 The following chart shows the contribution required from each member state towards the EU budget for 2016. Note, that this is the 6th amendment Draft Amending Budget 6 to the 2016 Budget, European Commission to the budget and shows that the budget itself appears to be in a constant state of flux. Also note that the calculationn of the rebate for the UK can be adjusted for up to 4 years following the budget year. It would be a lot easier to see what payments have actually been made if we had access to the UK’s Bank statement – this would settle the argument once and for all! Confused ? (you should be) just take a look at figures provided in the “official” document! The EU financial year runs from 1 January to 31 December, whereas the UK’s runs from 1 April to 31 March. The following table gives a breakdown of the UK’s transactions with the EU on a financial year basis between 2010-11 and 2015-16. The UK makes monthly payments to the EU. The actual payment is equivalent to the Gross amount, less the rebate (from the previous year). These figures do not take into consideration Public Sector payments received by the UK from the EU which would determine the overall net figure paid by the UK over the year. The Commission is directly and solely responsible for calculating the UK’s rebate. It calculates the rebate on the basis of a forecast of contributions to the EU Budget and the UK’s receipts from it. This is subsequently corrected in the light of outturn figures. Corrections may be made for up to three years after the year in respect of which the rebate relates, with a final calculation then being made in the fourth year, e.g. a final calculation of the rebate in respect of 2015 will take place in 2019. The effect of the rebate is to reduce the amount of the UK’s monthly GNI-based payments to the EU Budget. It does not involve any transfer of money from the Commission or other member states to the Exchequer. Migration to the UK has been a major topic of debate both before and following the EU Referendum. This article seeks to explore the facts behind the rhetoric. The Office for National Statistics (ONS) 1 is the UK’s largest independent producer of official statistics and is the recognised national statistical institute for the UK. Visual.ONS 2 is a website exploring new approaches to making ONS statistics accessible and relevant to a wide public audience. The site supports the UK Statistic Authority’s publicly stated intention of “making data, statistics and analysis more accessible, engaging and easier to understand“. They have produced a number of articles 3 4 5 related to migration to the UK. For each year between 1964 and 1979 more people left the UK than arrived, slightly more people arrived than left through the mid 80’s, but overall the net migration figures are hardly significant until around 1994. In 1992, the leaders of the 12 member countries signed the Maastricht Treaty aka the Treaty on European Union. This was signed by John Major (Conservative) on behalf of the UK. Following the ratification process the Treaty came into effect on 1 November 1993. After implementation of the treaty, people in the 12 member countries became European Citizens with the right to move, work and live in any other member country. Correspondingly, net migration figures started increasing from 1994 onward. Both immigration and emigration numbers have increased since 1998, with immigration exceeding emigration by more than 100,000 in every year since 1998. Tony Blair (Labour) held power from 1997 through to 2007 and there may be an argument that he was responsible for the upsurge in immigration that continues to this day. During his tenure, the Labour government put migration at the centre of its legislative program and one possibly controversial decision was to allow nationals from the new member countries from Eastern Europe joining the EU, to work in the UK following the 2004 enlargement of the European Union when 10 countries joined. While many of the existing member countries including Germany and France put restrictions in place to limit the potential impact of a sudden mass migration from the new member countries. The UK had no such restrictions in place. From 2011 there are no longer any restrictions on the free movement of citizens from these member states to any EU country. In 2015, an estimated 630,000 people came to live in the UK and 297,000 people left the UK giving a total +ve net migration of 333,000 people. …of people arriving, 44% (277,000) were non EU citizens, 43% (270,000) were EU citizens and 13% were British citizens. …of people leaving, 30% (89,000) were non-EU citizens, 29% (85,000) were EU citizens, and 41% (123,000) were British citizens. From ONS data, the most common reason for migrating to the UK in 2015 was for ‘work-related’ reasons. In 2015, 294,0009 people from outside the UK migrated to the UK for ‘work-related’ reasons. Of these, 61% (178,000) were from EU citizens, 24% (72,000) were non-EU citizens and the rest (44,000) were British citizens. 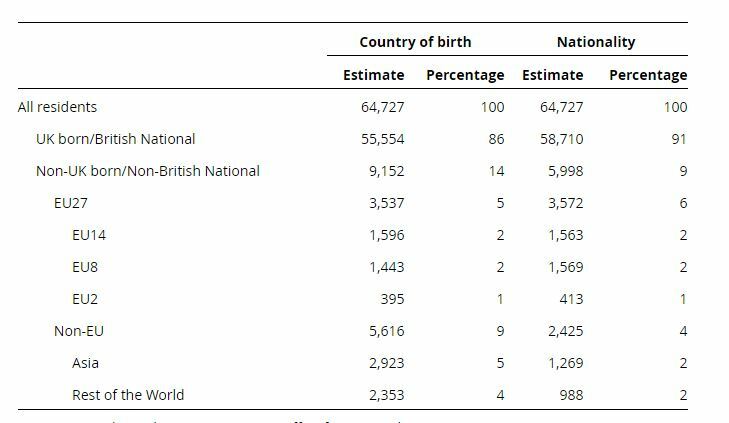 As of 2016, estimates from the ONS 8 shows that of the usually resident population in the UK, around 1 in 7 (14%) were born abroad and 1 in 11 (9%) had non-British nationality. The increase in non-UK born residents was driven by statistically significant increases in both EU and non-EU born residents; the statistically significant increase in the non-British population was driven by EU nationals alone (the number of non-EU nationals in the population has remained stable). Poland is the most common non-UK country of birth (an estimated 911,000 residents) and Polish the most common non-British nationality in the UK. In 2016 the number of Polish nationals resident in the UK reached 1 million.